This batch of five coaches seems to be rarely photographed despite their superb appearance enhanced once again by a beautifully simple livery on the most elegant of bodies. Delivered in May 1964 they were AEC Reliance 2MU4RA chassis with Harrington Grenadier C41F coachwork, fleet No’s were A247-A251, the photo was taken on Marine Parade Eastbourne probably in the summer of 1965. My impression was that Black and White operated very few extended tours or other excursion work instead concentrating on their extensive express service network, perhaps someone can confirm or contradict me on that point. I am not sure about extended tours but I think that Black and White did have a day excursion programme- how big the catchment area was I do not know. Given the peak requirements on Summer Saturdays, a source of midweek revenue was desirable. The only company I can think of with an express commitment pattern like Black and White (Yelloway) did have a substantial day excursion traffic with a huge catchment area. Black and White did handle quite a lot of excursion work as Malcolm states. Sometimes the official definition of ‘Excursions and Tours’ as used by the Traffic Commissioners etc was over embracing in many cases as operators may have run excursions but may not have run extended tours. 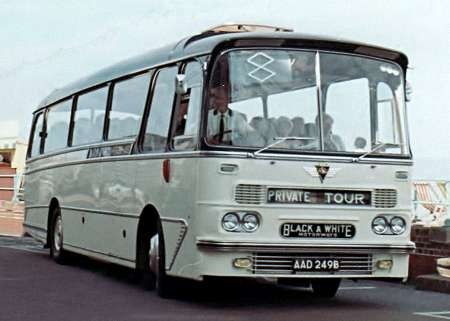 In addition to its work for Associated Motorways, Black & White was very active in the field of tours and excursions, which is how it all started out. An eight day luxury tour was also offered to North Wales and Snowdonia. ‘he best – usually the newest – vehicles were used for tour work, which required the hiring of vehicles from other operators to fulfil Associated Motorways commitments. A pool of drivers employed on tour work was established based on seniority – a highly prized position. There are numerous references to ‘tours’ to the Cotswolds, Forest of Dean etc which I think were references to day excursions but that is just my interpretation. DDG 256C is a Leyland Leopard with Harrington coachwork, in the fleet of Black & White Motorways of Cheltenham. 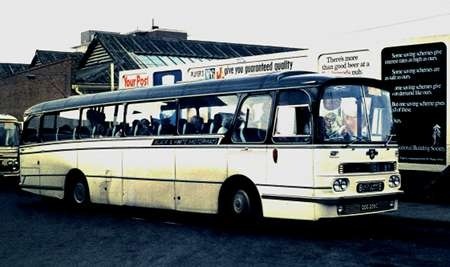 We see her at Southampton Coach Station – the "real" one in Bedford Place – on 22 August 1970. She’s on an Associated Motorways (remember?) service to Derby. 256, Black & White/A M, Harrington. She would have been on the cross country service via Oxford that ran with connexions at Oxford with the Northampton – Bournemouth service crewed by outbased drivers. If the Derby destination is correct, a check of the Associated Motorways timetable suggests this is more likely to be operating a summer Saturday journey which used the M5 and kept through traffic out of Cheltenham. It’s 09:34 from Portsmouth, 11:15 Southampton to Derby for 19:50. Non-stop from Southampton to Kidderminster apart from a halt at Strensham services. I don’t think Derby was served off the daily Oxford "mini interchange" – just Northampton and Nottingham by further connection. The timetable and the fare chart, where two things. The fare chart had routes that we could combine, often services, that include a mileage charge to be paid to Western/Southern National or other operators for running at peak times on their routes. 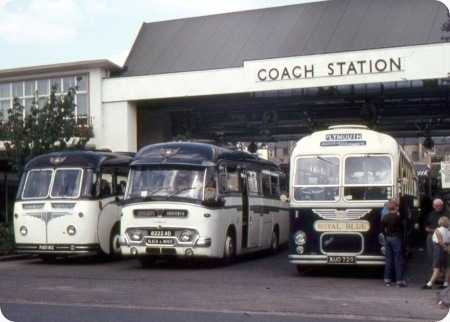 This was so one coach would take the overloads for a couple of routes, often to cover holiday fortnights. At certain time of the year seasoned travellers would apply by post for tickets on direct coaches, from their area to the coast. Then one Saturday morning the wrong charts got printed, instead of route instructions being printed direct night service via Cheltenham ere printed. The police where not to happy, we brought Cheltenham to a stand still at 01:00 in the morning, private operators who did the same work for years made their only visit to Cheltenham to be told to go away. We did have a few deckers turn up with overloads or taxis, one decker came up from Bridgewater, when we thought we had got rid of it it turned up at 03:30, on the night service driven by a fitter with another overload, or the Red and White with 9 taxis following who wanted paying there and then. Monday morning when the traffic manager and the accountant went through the cash books the duty clerk and inspector had some explaining to do, or why they booked 7 rooms at Carrs Hotel for Ribble/Yorkshire Traction drivers who came down on overloads from various points who expected to return straight away only for us to use their dps to move the passengers on. Yes, the Derby destination is correct. This entry on the blind shows quite clearly on my original, but please, nobody ask me to translate the windscreen sticker!